Don't let the $2.97 price fool you, this one makes for great tasting Sangria! Both Winos agree to purchase it again. Easily gets a Good Rating! This is a "good" sangria. I served it at a cookout and added some lemon seltzer to it....yummy. I intend to buy it again and again. I enjoyed the Oakleaf Sangria very much. I will buy again. 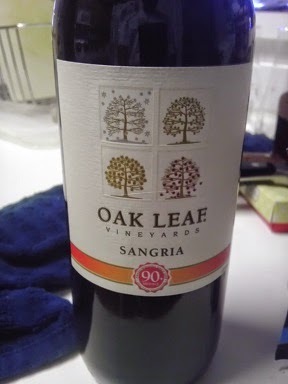 Oak Leaf Sangria is great! And even better with Italian orange soda and lots of fruit! Yum! Soooooo Good. I actually couldn't believe it!! But it's really good! Thanks for checking out our blog! Always great to get a tasty wine at a tasty price! We agree Oak Leaf has tasty wines at a great price! Thanks for checking out our blog!